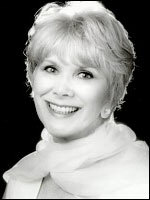 Best known for the harassed, dippy housewives she played in 1970s situation comedies, Wendy Craig has enjoyed a distinguished career in film and theatre as well as television. Born in County Durham, she made her first appearance on stage at three years old, later training at the Central School of Dramatic Art in London and appearing in numerous West End productions with actors such as Richard Harris and Peter O'Toole . During the 1960s she acted in films such as Room at the Top (d. Jack Clayton 1958), I'll Never Forget What's 'is Name (d. Michael Winner 1967) and The Servant (d. Joseph Losey 1963) for which she was BAFTA nominated. She made her first television appearance in The Cruelty Man (1957) playing "a pretty tarty sort of character" - very different to the respectable mums with which she became associated. During the 1970s and 1980s she became one of the UK's most popular actresses playing dotty middle-class mothers in domestic sitcoms Not in Front of the Children (BBC, 1967-70), And Mother Makes Three (ITV, 1971-76), and And Mother Makes Five (ITV, 1974-76). As Ria Parkinson in Carla Lane 's Butterflies (BBC, 1978-80; 1983) she made this role distinctively her own, Ria's culinary disasters and constant tirades against the boredom of housework giving voice to the frustrations of a generation of women. Lane's script was one of the first to introduce more serious themes into the sitcom format; Ria is "happily married but not excitingly married" to Ben ( Geoffrey Palmer ), a dentist who collects butterflies for a hobby. With sons Adam ( Nicolas Lyndhurst ) and Russell ( Andrew Hall ), grown up Ria is facing a mid-life crisis and tempted to have an affair with wealthy businessman Leonard ( Bruce Montague ). The theme of potential adultery was only one of the more serious issues dealt with in a series dubbed by Lane a "situation tragedy". Craig used her success in Butterflies to develop her career as a writer; adopting the pseudonym Jonathan Marr, she wrote and starred in Nanny (BBC, 1981-83), a serious historical drama based in the 1930s. In 1989, again using her pseudonym, she co-wrote and starred in Laura and Disorder (BBC), playing an accident-prone divorcee who returns to the UK after several years in America. In 1993, she starred with Sheila Hancock , Sheila Gish and Jean Boht in Brighton Belles (1993-94), an ITV version of the popular US comedy The Golden Girls ; Craig played Annie, a widowed farmer's daughter. After completing a long stint with the Royal Shakespeare Company , Craig re-appeared on television in 2002 as Aunt Juley in ITV 's adaptation of the Edwardian family drama The Forsyte Saga . She subsequently returned to her comic roots in nostalgia vehicle The Royal (ITV, 2003-), as the kindly, whimsical Matron - a fitting summation of all the TV wives and mothers she has played over the years.